After Miami, I headed down to Key West for a few days. 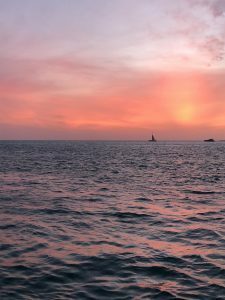 I wanted to see Key West for a couple of reasons. 1). The last time I had been there I was 8 years old. 2). I wanted to see how it survived Irma. And 3). I’m a fan of Jimmy Buffett and was hoping for a chance encounter. What I got was so much more. No, I didn’t see Jimmy Buffett, however, Key West was unexpectedly and extremely comfortable. Upon arriving in Key West I was greeted with a ton of strip malls, but once I moved into the historical district I immediately fell in love. Beautiful cottages intermingled with plantation style homes effortlessly. For a lover of architecture, it’s such a beautiful place to explore. I got to my hotel at 4 pm and after settling in I ventured out. There are very few places in the world where I have felt as safe walking alone, at night, on darkened streets. There is such freedom in that and I instantly felt like I could live there. 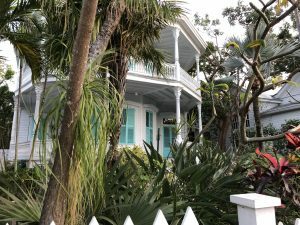 Everything in Historic Key West is very easy to walk to and even easier to bike. Key West is so laid back that you can ride your bike down the middle of a street and the cars wait patiently behind you. Island time at it’s finest. 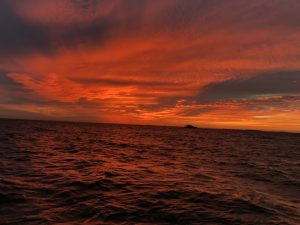 I was in Key West for 3 nights and saw an incredible sunset every night. My first night once I hit Duval Street I found myself following the spattering of strollers to Mallory Square. Where you can find a front row seat to the riot of colors painting the sky. My second sunset was on the docks after spending the day at the Dry Tortugas. Just beyond the many masts of everything from clippers to dinghies, you still had a pretty spectacular show. However, my third sunset beat them all. One of my friends asked me to take a sunset cruise with her. I thought why not. Free drinks and snacks and a sky so bright it looked like it was on fire! 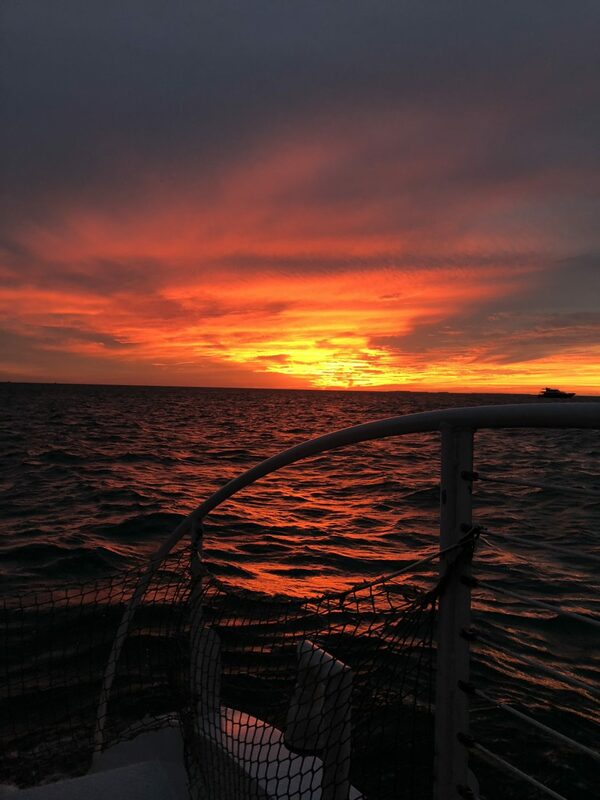 When it comes to sunsets Key West will not disappoint. It’s all about that golden time in Key West. 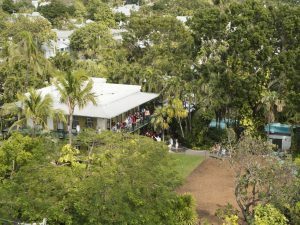 Residents love their happy hour and is a part of the fabric that makes Key West great. My first happy hour was at Hog’s Breath Saloon, a landmark staple with great live music and decent food on Duval Street. But you really don’t go to happy hour for the food, you go to unwind from your day and make new friends, and everyone wants to be your friend in Key West. My second Happy Hour was just as fun. As I was heading back to my hotel I stopped by a bar called Lucy’s Retired Surfers Bar on Grinnell street. It didn’t matter that I was windblown from my day at the Dry Tortugas or that I was wearing sweats, I don’t think I’ve ever been made to feel more at home. I sat at the bar and before I knew it everyone was chatting and I felt like a local. The food was good and at happy hour prices with everything half off, you really can’t go wrong. 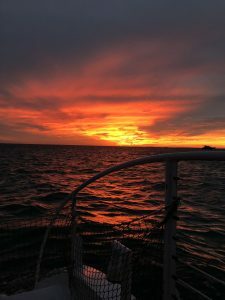 My third happy hour was on that amazing sunset cruise. Apart from an incident with a seagull that decided my finger was food, the trip was relaxing and entertaining. We boarded a catamaran in the fleet of Fury Water Adventures. Our cruise was the Commotion on the Ocean. We set out and almost immediately were inundated with seagulls wanting food. Our captain told us not to feed them but they were aggressive and I saw several people get their food snatched right out of their hands! But that didn’t detract from the open bar or the assortment of snacks available while we gazed out at the ever-changing sky. When you’re in Key West you are treated like a local. It’s just a fact. Every establishment I went into the people were kind and curious about you and if you were enjoying their wonderful city. 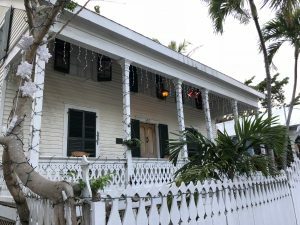 On my third day in Key West, I decided to bike over to Ernest Hemingway’s house. On the way, I stopped at Coffee Plantation on Caroline Street. Like many other places in Key West, there was a space set aside out front for bicycle parking. I just love that! The owners were warm and friendly and brewed up a great cup of coffee. I also had a croissant, it was my breakfast after all, and it came in a biodegradable palm leaf bowl, which I brought home! I loved the atmosphere and the art here so much, which was created by the owners, that I brought my friend back the next day and the owners remembered me! That’s customer service. On the way to Hemingway’s, I stopped at a small farmer’s market that is set up year round and daily with produce so fresh you wondered how you were going to eat fruit back home. 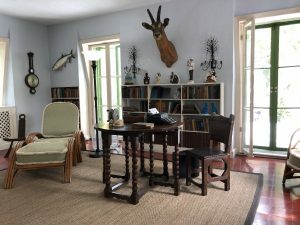 I almost rode right past Hemingway’s home. It’s completed walled in and if not for the small plaque denoting the house on the exterior of the gate I may have missed it. Inside the house and grounds are beautiful. Make sure that you take a tour. They are included with the fee and the tour guides are knowledgeable as well as humorous. Fair warning, if you don’t like cats you might want to give this a miss. 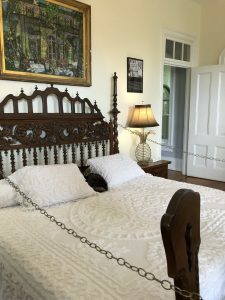 Hemingway’s house is famous for their 6 toed cats named after history’s famous elite and they are everywhere. 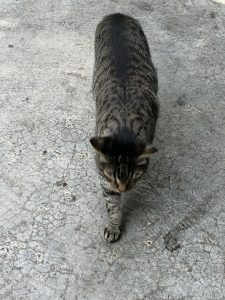 You cannot take a step without meeting a new furry feline. 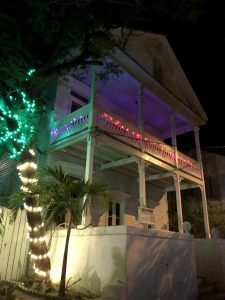 Hemingway was a known for his drinking and would frequent many of the establishments on Duval street. However, as he was stumbling home he would always look for the lighthouse, which conveniently sits almost directly across the street from his house. Pay $12 and you too can hike up to the top. 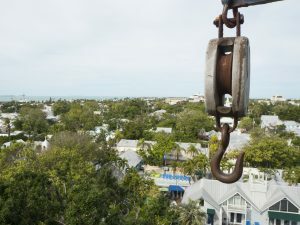 There you will find a mostly uninterrupted panorama of Key West. I had heard that it was hard to find free overnight parking in Key West. It’s true that most of the parking is residential and you have to be mindful of that. However, there is free parking to be had. If you can find a spot that does not read “Resident Permit Parking” or “Resident Parking”, you are able to park there for up to 3 days before you have to move it. It’s a great tip that will save you at least $18 per day! I had the best time in Key West. 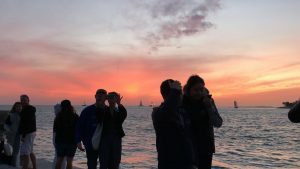 If you’re looking for a relaxing getaway where you don’t have to drive, you can revel in happy hour, and you want to feel like a local, Key West is for you. Where is your favorite getaway vacation? Let me know in the comments below.